2. What is going on in Goldcrest class? Autumn 1 in Goldcrest Class - we are enjoying getting to know you and your children. The children are settling into routines and taking ownership of shared learning spaces. One week to go until half-term! We started the new school year with an old favourite – the Tiger Who Came to Tea. The doorbell rings just as Sophie and her mummy are sitting down to tea. Who could it possibly be? We set up our classroom with a traditional ‘home-corner’ role-play to reinforce home-school links and to facilitate familiar play. Mrs Beaumont brought a HUGE tiger into school! The children engaged in language-rich play and made food for us to eat. We created a story map and shared it as a Family Learning task. It is lovely to observe the children continue to make their own story maps, adding arrows to explain the flow of their drawings. Sam, our class bear, celebrated his 5th birthday. The children printed bunting with different shapes, made paper decorations using resources from the graphics trolley, decorated biscuits, designed birthday cards and planned ‘what to do’ at the party……. We also tried out some greetings and phrases in different languages to mark the European Day of Languages. “Merci” to Eleanor’s mum for the bookmarks that were sent home. The children are also getting to know our PE coach Mr Mabbitt. The have enjoyed games to develop their spatial awareness and team-work skills. They are getting quicker at changing into their PE kits - you can always tell when Goldcrest have had PE by their unique dress sense at home-time! We always celebrate the children’s own efforts to dress themselves - does it matter if your badge is on your shoulder blade rather than your chest if you put your sweatshirt on independently? Phonics - we are working on phase 2 and expect to be nearly finished by half-term. Set 5: h, b, f, ff, l, ll, ss. We have listened carefully to find the sounds in words. We have written the letter shapes in the air and on the ground, on our hands with our ‘magic pencil’ and on our whiteboards. We are learning about vowels and letter families too. It is wonderful to see the children applying their developing writing skills in both adult-led and child initiated learning. ……………Little Red Hen Makes a Pizza? Working in the meadow we played pizza themed maths games and acted out the story. We made pizza too! 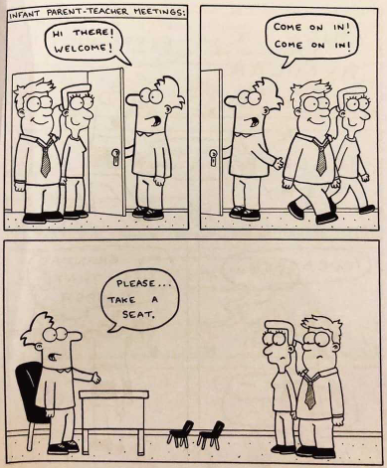 Volunteering in school. We welcome help in school and appreciate that you will have many different interests and skills to offer to support and extend the children learning. Last year, for example, we had parents in to help change Library books, re-stocking the classroom resources, to talk about their work, play instruments etc. 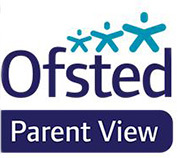 We appreciate that not all families are able to commit to a regular time in school, one off events, making resources at home, a termly gardening shift…. Thank you to our new Friday Tidy’ crew for your ongoing help in the meadow and atelier, and our Tuesday morning Library team. We hope to see you all at our Parent Teacher meetings on Tuesday 23rd and Thursday 25th October. Mrs Berry, Mrs Beaumont and Mrs Fullman will be at both sessions. Wishing you all a happy half-term with your families. Where will our learning take us next half-term? We have launched off in an unexpected direction….. William Shakespeare and his plays. Several children had asked about him so we decided to explore and see where the journey took us. We talked about William Shakespeare himself and the children knew so much! We are using A Midsummer Night’s Dream as an initial focus. For Family Learning we set the challenge to find out about any words that were used at the time of Shakespeare. We learnt that haste means quickly so we were tidying up the classroom with haste! We sent home some quotes from A Midsummer Night’s Dream too. The children in Goldcrest have used a flip camera to record each other. We will share some of the videos in our class assembly. We watched a little play on CBeebies and changed our classroom so that we too had a space to perform. We have scarves and fairy outfits ready as props. We also made a tuff spot with little characters and resources to support our learning. We spent the morning in our woodland collecting vocabulary to write poems. I smelld a wighld rose. I saw a stick it was long and spighcy. I like the big hill. It was fun bckos of the fairys. I saw a pricly ros. I saw a bumpy lumpy tree. I saw a wicid stingy stingnetl. I saw a spoty red ladybird. 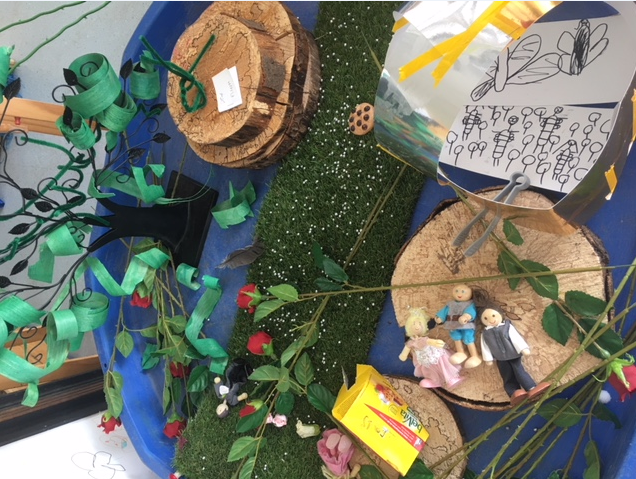 We worked with a partner to create fairy gardens using found materials. Mrs Berry and Miss Gaze observed some fantastic teamwork and collaborative play. In Busy Fingers we made big drawings. We wondered what woodland fairies might look like? We made a plan then used lots of exciting resources to make our own……We experimented with different ways to join the materials. We had to measure and cut too. 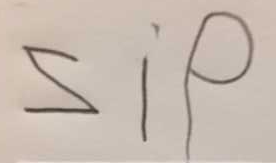 Phonics – we have revised all digraphs and trigraphs and are really focussing on tricky words and high frequency words including some, come, are, when and what. and are consolidating reading and writing them. We have been talking about syllables and have been practising clapping and counting syllables in words. We’re making plans for our transition into Year 1. From this week our mums, dads and care-givers will drop us off at the classroom door. Soon we’ll line up in the playground! We’re planning a secret mission to year 1 classrooms (shhhh – they’re out on a trip soon!) when we’ll play and learn in the year 1 spaces. Some children wrote a list for Mrs Beaumont to make a plan……. Welcome to Goldcrest Class, we are enjoying getting to know your children! We have been busy, both inside and outside, exploring our classroom, atelier and meadow. We are learning each others names, our Key Workers and the EYFS team. We have been observing your children very closely and making assessments to inform our entry baseline. Learning is very child-centred and based on children's interests. 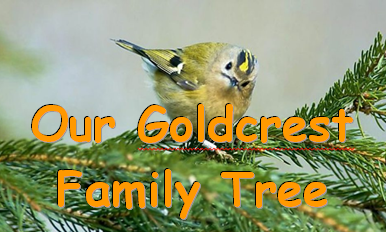 We have talked about our families and using your photographs from Family Learning we have created our very own Goldcrest family tree. We have shared summer holiday news and made observational drawings of sea shells. 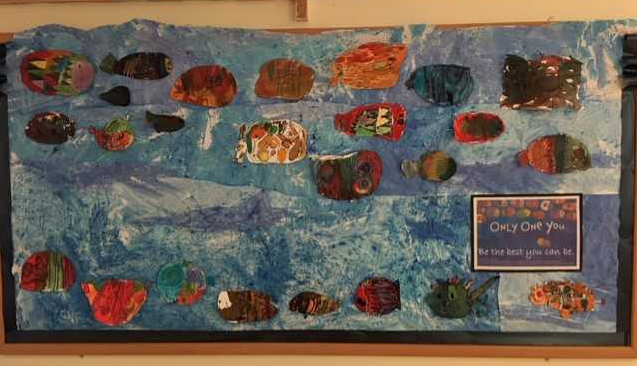 Continuing the seaside theme our class display in the dining room features the book ‘Only One You’. It’s a story with the message, ‘There's only one you in this great big world. Make it a better place’. We chose this story to illistrate our first school value: Be the best you can be. To be a community which excels in the academic, cultural, personal and social development of all pupils. We used line drawings and Brusho to create our individual fish and wax crayon resist to make the sea. The children have named our class bear Ben and he is working his way round the children visiting you at home. We do this to develop home/school links and to encourage follow-on opportunities for speaking and listening. Ben bear has a book in his bag that serves as a prompt for speaking. Please help your child to add something to the book for us to share, routine experiences such as home and play, tea and bath, or story and bed are absolutely fine! If you have Ben bear over the weekend please put him through a 40 degree wash, thank-you. We have also celebrated Ben’s birthday! We made cards, wrote invitiations and wrapped presents. We learned how to mix powder paints and made bunting to decorate our role play area. We read Biscuit Bear and decorated biscuits for a party. We made pizzas too! Using our emerging phonics skills we added our own ‘writing’ to our photograph or our pizza making. 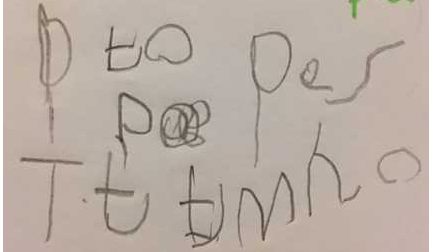 For example some children wrote piz = pizza (writing in reverse is very common) and to = tomato and some children wrote the initial sounds they could hear m = mushroom p = pepper. It is amazing to share the childrens exciting learning journey to become writers.